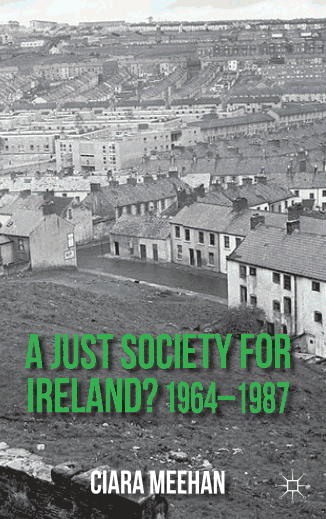 Ciara Meehan’s recent publication A Just Society For Ireland? 1964-1987, deals specifically with the question of the influence of Declan Costello’s Just Society document of the 1960s and in particular its influence on future Fine Gael leader Garrett Fitzgerald. This is Meehan’s second book to dealing with the Fine Gael tradition in Ireland. Her first book The Cosgrave Party dealt with the ten-year history of Cumann na nGaedheal before it amalgamated with the National Centre Party and the Army Comrades Association, aka the Blueshirts, to become Fine Gael. This book, of just under 200 pages, takes a very specific look at an aspect of Fine Gael’s history which Meehan argues has been neglected by many historians and academics. It may very well be the case that not many historians see this issue as being worthy of a full academic investigation. However the book also serves a purpose as a general history of Fine Gael and Irish elections and gives a brief outline of some of the parties most influential characters such as Gerald Sweetman, Patrick McGilligan, John A Costello as well as Declan Costello and Garrett Fitzgerald. There are plenty of references to Fine Gael/ Cumann na nGaedheal policy of previous decades. Using Fine Gael party minute books Meehan pieces together the internal discussion around Declan Costello’s 1964 proposal document Towards A Just Society. Declan Costello was the son of John A Costello, the Fine Gael Taoiseach during the two inter-party governments of 1948-51 and 1954-57. Declan Costello like his father never became leader of the Fine Gael Party, although both were popular and certainly could have challenged for the position. Both Costellos had significant legal careers with Declan serving as Attorney General in the 70s and as a high court judge in the 1990s. Costello junior, as Meehan points out was the judge in the X-case in 1992 who granted the injunction to prevent a fourteen year old girl travel to the U.K. to access abortion. In the early 1960s Declan Costello drew up an internal policy document for the Fine Gael Party. The document intended to point a new direction for the party by moving slightly leftward and adopting a more liberal economic and social agenda. The document entitled ‘Towards A Just Society’ did not get the full support of the party members, but was eventually if somewhat unevenly adopted by the party prior to the 1965 general election. It’s a long way from Ernest Blythe and perhaps further still from Michael Noonan. But it is a reflection of its time rather than a huge shift within the ranks of Fine Gael. The document was the subject of four internal national party meetings and was opposed and criticized by the more conservative members of the party like TDs Gerald Sweetman, James Dillon and Paddy Belton. Those in favour of the policy shift were tagged by the press as the young tigers but as Meehan explains it was not a question of young versus old as debate on the document was a reflection of ideology rather than age. The document was eventually leaked to the press which in turn forced FG into making a decision on it. In the early 1960s Ireland was emerging from the ‘lost decade’ dominated by stagnation, high unemployment and emigration. Ireland was still lagging economically behind its European neighbour’s and Irish society as a whole remained socially conservative. The housing question as ever remained a huge problem as the building programmes of the previous decades had not solved the crisis of accommodation particularly in the urban areas and in particularly in Dublin. Tenement buildings continued to be a problem and a physical hazard in the city. Organised opposition came in the form of the Dublin Housing Action Committee while Fianna Fail were by far the biggest political party having achieved significant success by tapping in on the discontent of the working classes. By targeting the new working class estates and stealing Labour’s clothes in as much as they adopted aspects of British Labour Party policy to develop their popularity, Fianna Fáil became a mass party. In the eyes of the media Sean Lemass was perceived as a forward-looking leader, the man who had turned Ireland from an inward conservative nation to one that now looked outward to joining the European market and opening up her economy. After the success of the economic policies of Sean Lemass’ Fianna Fail governments, Fine Gael needed to adapt to survive. What this meant for a struggling Fine Gael Party was the need to adapt and modernise or they would be left behind permanently. They needed to offer something more than just opposition to Fianna Fail. Costello’s document was essentially an 8 point plan which adopted the ideas of economic planning; with the credit policies of the commercial banks brought under government control and emphasized the necessity of social capital investment. It was a proposal that intended to tackle inequality within the Irish economy. A ninth point was later added to deal with agricultural policy, perhaps as a compromise to those conservative members who were opposed to the proposals, but Gerald Sweetman who fought for its inclusion was more than likely thinking of the party’s electoral base. The party established a policy committee under the chairmanship of Liam Cosgrave to develop Costello’s proposals into a comprehensive party programme. Garret Fitzgerald, who was not yet a member of FG was invited to join that committee. Meehan quotes Fitzgerald on that experience and his admiration for Costello, ‘the following nine months were a busy period as our somewhat heterogeneous group, which was bound together by one common factor – admiration for Declan Costello and for his effort to give a new, contemporary relevance to Irish politics’. Fitzgerald’s admiration for Costello is fairly clear. The proposals became the foundation of the FG manifesto for the 1965 general election, although the party as a whole still seemed unwilling to embrace change, there was an absence of alternative proposals. ‘Towards a Just Society’ caused great unease among conservative Fine Gael members. The Just society had the potential to broaden the party’s electoral base but the party was not equipped for communicating effectively with the general public. Its impact is questionable as the areas where FG vote improved was in the west amongst farming communities and as Bryce Evans (Author of Lemass biography) argues this may have more to do with Lemass’ neglect of agricultural policy than of FG activity. The policy remained influential within the party structure to the degree that it fought the 1969 election under the banner Winning through to a Just Society although Costello’s supporters were disillusioned by then. Little was done over the following decade to advance any of the proposals in the Just Society document until Fitzgerald became party leader in 1977. Fitzgerald’s Constitutional Crusade is often associated and compared with the Just Society proposals. This is the main theme of Meehan’s book. Meehan suggests that the comparisons are overplayed and the main difference being that Fitzgerald actually got the opportunity to implement his policies. But not without great difficulty and upheaval as she points out the massive difficulties of pursuing a socially liberal agenda in the 1980s. The Constitutional crusade attempted to implement a set of policies that would make Ireland a more pluralistic society, some argue that this reflects Fitzgerald’s own mixed religious background. The motive behind Fitzgerald’s campaign was not economic equality but an end to religious bigotry which he believed was the key to Northern Ireland and re unification. Unfortunately for Fitzgerald tackling religious bigotry meant tackling the sectarian nature of the Irish constitution. This inevitably led to conflict over the divisive issue of divorce and abortion. Meehan’s book shows the contradiction between Fine Gael’s sometime aspirations to be a liberal party and its conservative base, which was again illustrated in he abortion debate of 2013. The divorce and pro-life referendums of the 1980s were not only indicative of the socially conservative nature of the Irish Republic but they were also deeply divisive for the rank and file Fine Gael. This is the crux of the problem for both Fitzgerald and Costello, attempting to build a liberal capitalist party with an essentially conservative membership and voter base has proved extremely problematic. This was still the case in 2013 with an exodus of TDs after the introduction of James Reilly’s Protection of Life During Pregnancy bill. Meehan’s book attempts to show that this represents an internal contradiction within Fine Gael, a crisis of identity that goes back to Costello’s Just Society. One Response to "Book Review, ‘A Just Society for Ireland?’"
I first voted in the general election of 1973 and voted for Fine Gael /Labour on the strength of the Just Society document. A lot of people at the time were fed up with the arrogance of Fianna Fail and voted the same as me. FG/Lab got plenty of radio,television and newspaper support at the time. As soon as they obtained power the “Just Society” document was forgotten and the country became a virtual police state run by 4 ministers who done everything to advance their own agenda’s. For Gods sake even the Taoisheach of the day voted against his own party in the Dail. It was the worst government we ever had until the present lot arrived. For arrogance and chicanery it is difficult to beat Fine Gael/Labour in power.